Philip Heller is a technical author, novelist, public speaker, and consultant. He has been instrumental in the creation and maintenance of the Java Programmer and Developer exams. His popular seminars on certification have been delivered internationally. 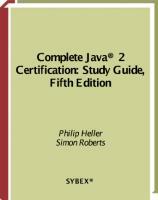 Simon Roberts is a Sun Microsystems programmer, an instructor, an authority on the Java language, and the key player in the development of the entire Java certification program.